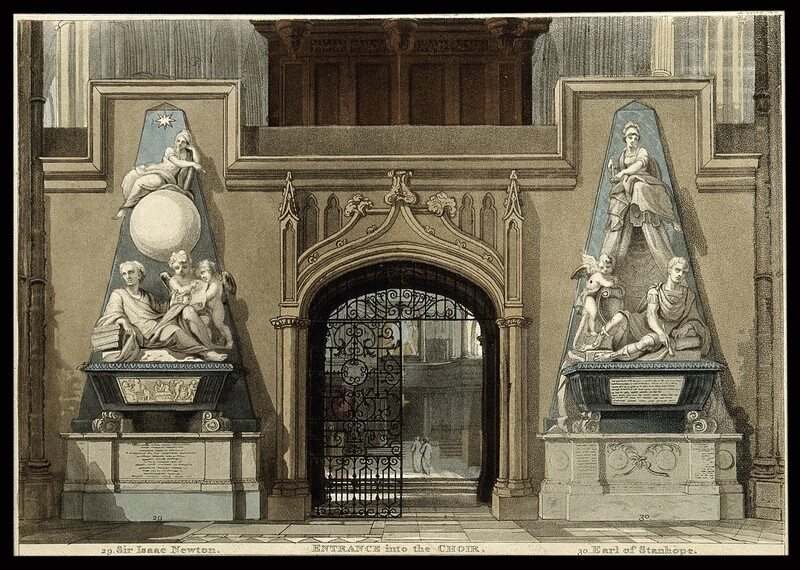 Postcard illustration of Sir Isaac Newton’s monument at Westminster Abbey, London. Source: Wikimedia Commons. Over the past two decades, high profile debates over human origins, abortion, and stem cell research have distracted from the opportunities that scientists and religious Americans have to forge relationships built on common values and goals. Though topics such as the teaching of evolution may generate disagreements, other areas of science such as health, sustainability, climate change, and food security may not. Even in the face of disagreements, dialogue-based efforts can help break down stereotypes between scientists and people of faith, cultivating mutual respect and personal relationships. These are some of the main points of emphasis in the new American Association for the Advancement of Science report, “Scientists in Civic Life: Facilitating Dialogue-Based Communication.” The booklet provides an overview on relevant research, practices, and examples that scientists can draw on in encouraging more thoughtful dialogue about science and society. In authoring the report, I spent the past 18 months collaborating with staff at the AAAS Dialogue on Science, Ethics, and Society (DoSER). The publication is the first in a series of science communication-related resources funded by AAAS, the John Templeton Foundation, and private donors. The aim of the new booklet is to empower scientists and their institutions to play a more active role in bringing Americans of diverse backgrounds together to spend time talking to each other, contributing to mutual appreciation and collaboration. Churches are a vital, yet overlooked, place to begin. Religion is more than just a belief system that shapes how people understand science or prioritize a problem like climate change. Churches are communication centers where information can be shared and conversations can take place about science and technology-related issues. For these reasons and others, it is important for scientists to build strong relationships with their local churches, temples, and mosques. Congregational leaders rely on strong interpersonal bonds and norms of stewardship to encourage their members to participate in civic-related activities. These networks are further strengthened by the moral framing of issues by church leaders, the conversations that church-goers have with others, and information provided directly when at church. Churches and other faith institutions can therefore serve as powerful networks of civic recruitment. In such contexts, people receive requests to become involved in their communities. They may be called upon to help people recover from the impacts of climate change, to work on actions to educate their communities about public health, or to voice their opinions to elected officials on topics like evolution or biomedical research. Nisbet, M.C. (2018). Scientists in Civic Life: Facilitating Dialogue-Based Communication. Washington, DC: American Association for the Advancement of Science. Studies show that the more requests a person receives in a social setting like a church, the higher the level of their civic and political participation. 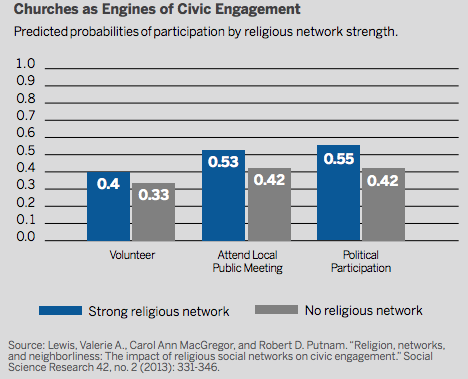 Similarly, the time that church-goers invest in building relationships with each other and in shared communal action translates into higher rates of civic participation outside of the church (see figure above from report). In facilitating productive dialogue about science topics that intersect with faith and religion, all scientists have a role to play. Regardless of their personal beliefs, when engaging in conversations with faith communities, scientists can connect around common values and interests. trends, school districts, cultural traditions, natural resources, and climate/weather events. particularly well-positioned to serve as trusted dialogue brokers. By one 2011/2012 survey estimate, approximately 11 percent of U.S. biologists and physicists say they attend church services at least weekly and a similar proportion say they hold no doubts about the existence of God. More than one-third claim a religious affiliation (see Table below). “boundary pioneers” are likely to be effective at facilitating conversations between their fellow scientists and those members of the public who share their faith. In doing so, boundary pioneers can draw on their own experience to share insights on the relationship between science and their personal faith. A leading example is Texas Tech climate scientist Katharine Hayhoe, who as a Christian Evangelical regularly speaks to congregations about climate science, drawing on her faith to connect to audiences by way of a shared identity and language. Katharine Hayhoe discusses her approach to dialogue with Climate Outreach’s George Marshall at a forum held at University Church of St Mary in Oxford, UK. Many religious leaders and clergy are also interested in facilitating constructive conversations among their congregations and faith communities about scientific topics. in how to lead thoughtful dialogue about the social implications of science. To address this gap, the AAAS Dialogue on Science, Ethics, and Religion (DoSER) program has partnered with Christian seminaries and theological schools to include more science in their core curricula as part of an ongoing “Science for Seminaries” project. Each partner seminary, in consultation with AAAS, integrates science articles, books, films, guest lectures, laboratory and research site visits, and other content into core course offerings such as biblical studies, church history, and theology. These resources are developed in collaboration with local scientists, to build and strengthen relationships with local science institutions. Jewish clergy, scientists, and laypeople with the knowledge and skills to engage in dialogue and learning about society’s biggest questions, drawing on science and religion as sources of wisdom and inspiration. 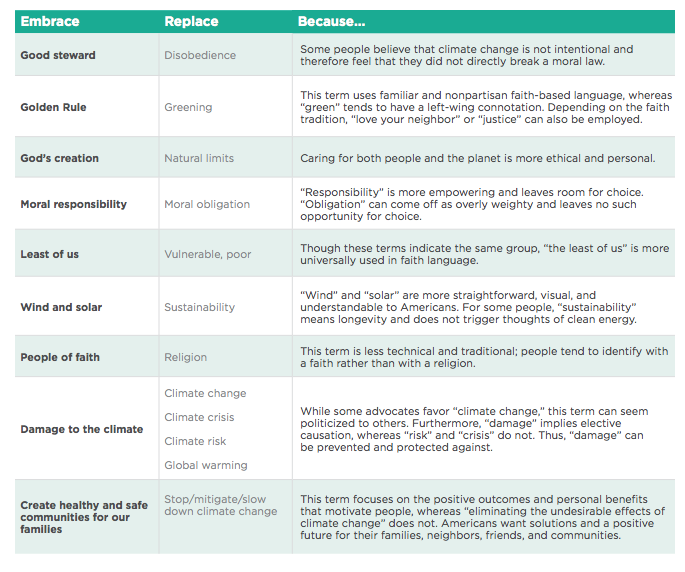 Specific to climate change, research conducted by the UK based nonprofit ClimateOutreach has examined the narratives, metaphors, imagery, and frames of reference that can be used by scientists and religious leaders to engage people of faith by way of informal conversations, public statements, popular articles, and sermons. This research and similar studies recommend presenting a commitment to climate change as representing a moral responsibility to God, to our children, neighbors, to the “least of us,” and “all of creation.” Climate change can be discussed as part of a story arc that encompasses a challenge, an action, and a resolution — a narrative style familiar from scripture. The U.S. based non-profit ecoAmerica has used research it commissioned to develop examples of specific language that church leaders and others can use to connect with congregations around climate change and its solutions. ecoAmerica: 2016. Let’s Talk Faith and Climate: Communication Guidance for Faith Leaders. Washington, D.C.
approach has limits, especially outside of a localized, dialogue-focused framework. For example, an analysis of responses by Catholics to Pope Francis’ 2015 Laudato si encyclical on climate change found somewhat predictably that liberal Catholics tended to assign the pontiff greater credibility on the issue, while more conservative Catholics assigned the pontiff less credibility. In this case, the political identity of these Catholics tended to trump their faith-based one. 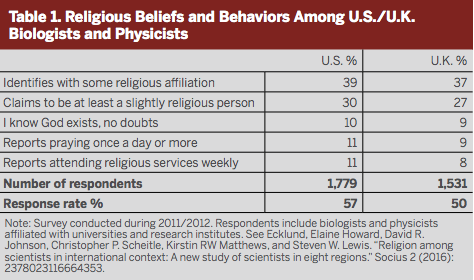 Looking ahead, as more and more scientists and their institutions turn to locally-focused dialogue activities to engage publics on the biggest science and society questions, a first step towards improved relations with religious Americans and their churches may be simply to recognize and affirm shared values, beliefs, and goals. With this established, as the new AAAS report details, further dialogue can be structured in such a way as to encourage working together towards common goals on politically contentious issues.